There are always 2 things that are major obstacles to push any "alliance or reorganization" forward. I like how we people keep forgetting everything. (02-09-2019 10:45 AM)Yosef Himself Wrote: I honestly think CUSA is fine as well. They do complain about their conference a lot, but mainly I think it's due to the fact that they want it to be as prestigious and good as CUSA2.0, which if it happens will take a lot of time. 2.0 wasn’t that prestigious either. Football was mediocre at best and it was Memphis and the 11 dwarfs in basketball. 1.0 was the prestigious version especially in basketball. The problem with those scenarios is that you go back to square one. The issues remain the same. Nothing is getting fixed short term. Some of those schools would rather be somewhere else like UTEP in the MWC and Rice with their peers in the AAC. Different agendas, different missions. It won’t work. C-USA made the mistake in going to 14 too fast. It’s done. We can’t expel members because the conference overreacted. Football and basketball are improving but it’ll probably be 3-5 more years (it’d be 10 years of the current configuration) until you see the full potential of the conference. This SBC/CUSA topic seems to appear a few times a year. The basic advantage is lower traveling costs and creating regional rivalries for both conferences. The Sports Business Journal published an article about the subject a few years ago. It is called "A common-sense solution for conference realignment." The article includes NMSU and Idaho right before they left the SBC. Quote: This SBC/CUSA topic seems to appear a few times a year. Couple times per quarter, maybe even month. But to do that allignment you'd have to ignore some hard feelings in LaTech/ULM and from what I gathered ArkSt looks more eastward with recruiting. Troy and USA would lose their rivalry and UTSA/TxSt are sitting on top of one another. Then you have the Florida Twins which throws another kink into the mix. Find a way to put Missouri State in somewhere. Both C-USA West and SBC West schools wanted them in. Lets say UTEP and UTSA gets invited to MWC in the future? Right now, UTEP would block New Mexico State from joining. There would be more votes for Missouri State instead of New Mexico State. West - Little Rock and UTA who goes to the WAC. La.-Monroe gets left out. Missouri State takes their place. James Madison U. does help Marshall out even more on the east. If. And I say IF the NCAA would increase the payout of $1 million per school up to 12 schools then I'd see Missouri State being welcomed into the Sun Belt but that'd be a 3rd or 4th option for the Belt behind trying to snag schools already in the FBS. No one will be added (unless they're a home run) with the payout capped at 10 teams. (02-09-2019 04:30 PM)DavidSt Wrote: Find a way to put Missouri State in somewhere. 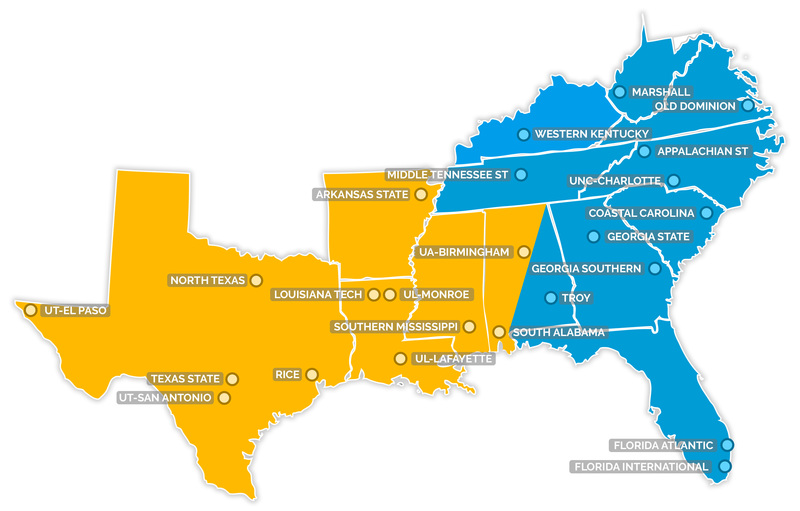 Both C-USA West and SBC West schools wanted them in. Lets say UTEP and UTSA gets invited to MWC in the future? Right now, UTEP would block New Mexico State from joining. There would be more votes for Missouri State instead of New Mexico State. (02-09-2019 04:04 AM)AuzGrams Wrote: Should the Sun Belt Conference & Conference USA form a partnership to help both leagues with travel and more regional rivalries? I think both leagues are far off from where the AAC or even MWC is in terms of strength in basketball and football. Would this sort of alliance help both leagues? Sadly he's not. As Panama said, he's just playing The SIMS NCAA.